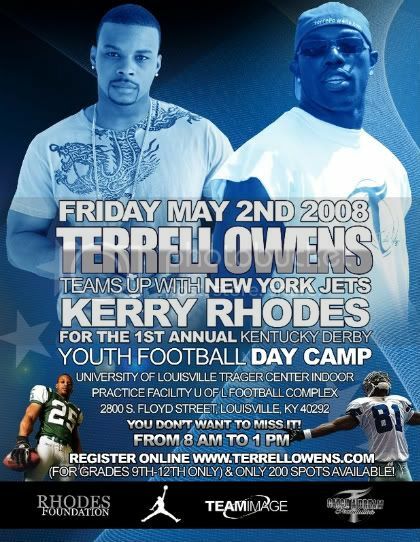 New York Jets safety Kerry Rhodes has teamed up with Dallas Cowboys top man Terrell Owens to present the 1st Annual Kentucky Derby Youth Football Camp on May 2, 2008 in Kentucky. Rhodes, who was drafted from Louisville holds Kentucky very dear to his heart and is excited about doing something in one of the states he considers like home. Later on that day from 4pm -6pm at the Spectrum Building located at 911 South Brook Street Louisville, KY 40203 everyone can come out and enjoy the celebrity basketball game that will include your favorite celebrities with Kerry and Terrell on one team and the And 1 players including "Hot Sauce" on the other team. Proceeds will go to both the Kerry RHODES Foundation and the Terrell Owens Foundation. Press Media Inquiries for Kerry Rhodes can go through his PR company Ideal PR and publicists Neeta Wooten or Tamiko Thomas. Press/Media Inquires on behalf of Terrell Owens can go through his publicist Kita Williams.